New York Governor Andrew M. Cuomo has been busy revitalizing more cities around his state lately, using his popular $10 million Downtown Revitalization Initiative (DRI) awards. Two days in July offer an example of why I (Storm Cunningham) consider him the most revitalization-oriented governor in the U.S.
On July 2, 2018, he announced six transformational projects for Kingston. The strategic investments in Kingston’s Stockade District will provide public open space and amenities for the community, improve walkability and transportation access and support small businesses. 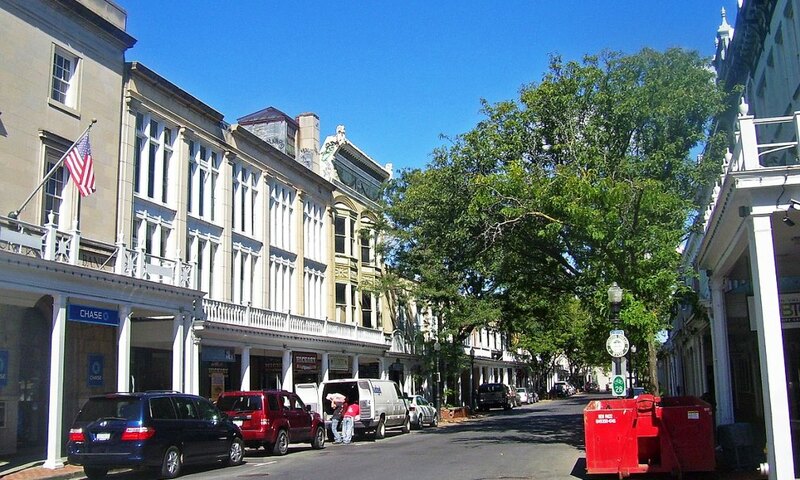 Kingston’s Stockade District has historically been the city’s center, containing county office buildings, financial and professional services offices, the city’s sole supermarket, and key recreational spaces. Within the past ten years, downtown Kingston has experienced a renaissance led by an influx of new investments and a resurgence of new cafes, restaurants, and boutique shops. Kingston has an ideal combination of recent strategic investments, shovel-ready future opportunities, involved anchor institutions and partners, recent infrastructure improvements, and supportive policies and plans that jump-started the DRI planning process. That same day, Cuomo also announced 11 revitalizing projects for Rome. The strategic investments in downtown Rome will drive advanced manufacturing job growth, transform public spaces, improve walkability and transportation access. Rome’s downtown area is rich in commercial, cultural, transportation, and recreational assets that support a vibrant and walkable place within the city. The catalytic projects that will be implemented by the DRI will further the job growth in advanced manufacturing, cyber technology, unmanned systems, and craft food & beverage manufacturing that are is already transforming the region. The city plans to further development and inspire innovation, facilitate residential repatriation, promote arts-based businesses, encourage alternate transportation, and celebrate diversity. With a boost from the DRI, Rome hopes to provide the ecosystem necessary to attract and retain young professionals and their families. A day later, on July 3, 2018. Cuomo announced DRi funding for 12 transformational projects in the South Bronx. The strategic investments in the South Bronx will connect the commercial and cultural nodes within the Civic Center to create a unified downtown that provides a high quality of life for residents and visitors; supports inclusive economic growth and opportunity and preserves and promotes the borough’s unique heritage and identity. The neighborhood includes the area bounded by 144th Street on the south, 165th Street on the north, the Harlem River on the west and St. Ann’s Avenue/East-Third Avenue on the east. The South Bronx is one of New York City’s most rapidly evolving areas. Neighborhoods like Mott Haven, Concourse Village, Melrose and Morrisania have undergone dramatic, grassroots and community driven transformation. The South Bronx is booming with private and public investments in affordable housing, cultural facilities, retail and other sectors. Many local policies enabled this growth of activity, such as the South Bronx Initiative and Melrose Retail Strategy, and the resultant Lower Concourse rezoning. Also on July 3, the governor announced four revitalizing projects had been funded by the $10 million DRI award in downtown Hicksville (within the town of Oyster Bay). The strategic transit-oriented development investments will support increased access to transportation, improve walkability, and redevelop underutilized property for mixed uses, including residential units, retail, and parking. These awards also align with the Long Island Regional Economic Development Council’s key strategy to integrate smart growth principles of transit-oriented development. Hicksville is a transit-rich and diverse community within the Town of Oyster Bay in central Nassau County. The DRI area is located within the hamlet’s central business district, and includes ethnic dining establishments, specialty food markets and cultural centers, as well as retail and office spaces. Hicksville is home to both retail chains and downtown mom-and-pop storefronts. Public support for revitalization, coupled with DRI funding, will allow improvements in the downtown pedestrian environment to make it safer and incentivize walking and biking as viable transportation options. Hicksville is already strategically positioned to benefit from and contribute to the projected growth in healthcare, high-tech, and educational industry sectors, making it an attractive area for educated and well-paid professionals. Pending improvements to the busiest station on the Long Island Rail Road will provide the opportunity for a true renaissance of the area. With anticipated increases in commuter traffic and demand for housing, the vision for Hicksville also includes new public space for events and increasing the diversity of housing stock. Now in its third year, Governor Cuomo’s Downtown Revitalization Initiative invests $100 million annually into 10 downtown neighborhoods around the state. Photo by Daniel Case via Wikipedia shows Kingston’s historic Stockade District.